Participants in the Thoroughbred industry often speak of the highest highs and the lowest lows that they experience during the course of their years in the businesses of racing and breeding horses. But the Parbhoo family experienced both extremes in the space of two hours June 9 at Belmont Park when Trinniberg won the $400,000 Woody Stephens Stakes (gr. II) two races after Giant Ryan broke down in the True North Handicap (gr. II) and was fighting for his life with multiple fractures. Several dozen members of the family flooded the winner’s circle after Trinniberg rebounded from an unplaced Kentucky Derby Presented by Yum! Brands (gr. I) effort to take the Stephens while flashing the kind of speed that makes him look unbeatable going seven furlongs. The son of Teuflesberg has now won three graded stakes at that distance, having earlier this season taken the Bay Shore Stakes and Swale Stakes (both gr. III) following an unplaced effort in the Sentient Jet Breeders’ Cup Juvenile Sprint last November. In the Run for the Roses, Trinniberg ran second for the first mile before fading. Parbhoo said he was 6 years old when he started gambling at his local racetrack in the two island Republic of Trinidad and Tobago, where his father trained. The family came to the United States 20 years ago, and its participation in a trucking business allowed them to enter the world of Thoroughbreds. Bisnath Parboo started in the U.S. as an owner, then took out his trainer’s license in 2007, but was not an overnight success. 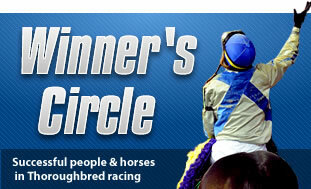 It took him nearly 100 races before he got to the winner’s circle. But by 2010 his horses had earned well over $1 million, and he has developed stakes winners Exclusively Maria, Giant Ryan, and Trinniberg, the latter of whom came to the family fold in a most unusual set of circumstances. Shivananda was in Ocala to buy supplies but arrived before the store opened and he needed to kill time, so he wandered over to the 2011 Ocala Breeders’ Sales Co.’s April 2-year-old auction. Trinniberg has now won four of nine races and nearly $600,000. The next goal is the Foxwoods King’s Bishop Stakes (gr. I) at Saratoga at an ideal seven furlongs. Parbhoo said the horse would go to the New Bolton Center in Pennsylvania for surgery. The father and son have different spellings of their last name because of a typographical error in the paperwork when they immigrated to the U.S. The ‘h’ was mistakenly left out of Bisnath’s last name. Bisnath Parboo is based at Calder Casino & Race Course in Florida with about 20 head. He was the leading trainer by wins and his son the leading owner by wins at Calder’s 2010 Tropical meeting. Bisnath has trained 565 winners in his career that have earned $2.7 million in purses and has taken 11 of 56 races so far in 2012, good for just under $700,000 in earnings.